Is it possible to have PDF open at a predefined magnification in Adobe Reader? Question:We have a downloadable PDF file which looks great at 72% magnification in Adobe Reader and not so good at 101%. When downloaded and opened in the reader, its default magnification is 101%.Is there a way to define the default magnification in the PDF file itself so that we ensure the best user experience? Is there any way to solve this matter in VeryPDF? Answer: When you need to open PDF at a predefined magnification in Adobe Reader, maybe you can have a free trial of this software VeryPDF Advanced PDF Tools, by which you can define open magnification without opening PDF file and even if without PDF reader installed. There are two versions of this software GUI version and command line version. Here I will take the GUI version for example. By this tool, you can also edit PDF description, PDF custom description, PDF OpenAction options, PDF page view options, PDF metadata contents, and so on. Please check more information of this software on homage, in the following part, let us check how to use this software. Same with other GUI version software, when downloading finishes, you need to install it by double clicking the exe file and following installation message. Please choose the proper version to download there are many versions of this software on Try and Buy website. The following snapshot is from the software interface,please have a check. Step 2. 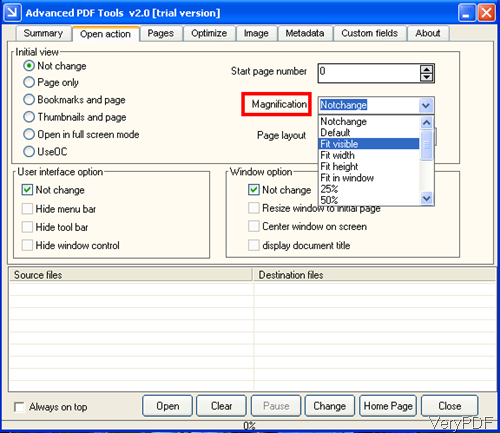 Specify a predefined magnification for opening PDF. When you use this software to open PDF at a predefined magnification, please open software interface and go to tab of Open Action. Then you will see tab interface like the above snapshot. Please go to part of Magnification then you can choose the open PDF magnification of the PDF files. Here you can also specify other open actions like start page, end page, page layout, bookmark and page, thumbnail and page, user interface open actions like hiding menu bar, tool bar, window control, document tile and others. When you finish setting, please click button Open to add PDF files to software interface in batch. Then click button Change to run the changing process. A few seconds later, you can find output PDF file in specified output folder. By this software and this function, you can open PDF at predefined magnification in batch without opening PDF. In other tabs, you can do other changing to PDF files. Please experience it yourself. During the using, if you have any question, please contact us as soon as possible. How to open a local PDF file in Chrome? How to open PDF at specific page using VB script? How can I programmatically open PDF at a certain point? How to remove pdf art box using command line? How to edit pdf keywords information using Advanced PDF Tools Command Line? This entry was posted in Advanced PDF Tools and tagged open PDF. Bookmark the permalink.